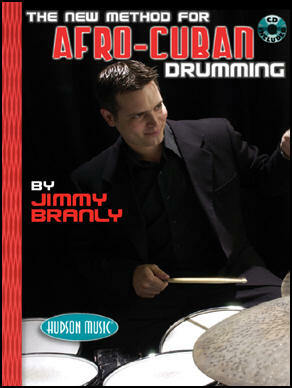 Tiger Bill's review of The New Method for Afro-Cuban Drumming by Jimmy Branly from Hudson Music. The New Method for Afro-Cuban Drumming book/CD features Jimmy Branly's approach to playing contemporary Latin rhythms on the drumset. Let's check it out and see if it's worth your time and hard-earned cash. Chapter 1 - The Clave: If you aren't yet familiar with the basic Son and Rumba Clave patterns, this chapter will show you both in written form and in audio examples on the included CD. Chapter 2 - The Cáscara: Covers three basic Cáscara patterns and explains their use in Afro-Cuban music, and how they fit in with the Clave. Chapter 3 - The Bombo Note: This section shows you where the bass drum pattern fits in with the previously learned Cáscara pattern. Chapter 4 - Hi-Hat Variations: This chapter adds the Maraca pattern to the mix and shows it's application with the Bombo. The Bongo Bell pattern is introduced. Chapter 5 - The Bongo Bell: Concentrates on the Bongo Bell and its variations. Also covered are Bass Drum combinations played over the Bongo Bell. Chapter 6 - Ideas for Soloing: In this chapter Branly demonstrates some soloing ideas against the Clave pattern. Chapter 7 - Guaguancó: Branly applies the Guaguancó to the drumset. Chapter 8 - Cha Cha Cha: This section begins with the traditional Cha Cha Cha pattern and progresses into some modern Latin-funk grooves. Chapter 9 - Afro-Cuban 6/8: The final chapter covers the various Afro-Cuban 6/8 Clave and Bell patterns. CD: The 97 tracks included on the 65 minute audio CD cover all of the patterns in the book. Also included are band tracks, both with and without drums, so you can practice your newly learned rhythms in play-along fashion. Although brief, less than 30 pages of written exercises, this book/CD serves as a good introduction to Afro-Cuban style music as performed on the drumset. It progresses nicely with each chapter building upon the prior one. I recommend it to anyone who is interested in adding the Afro-Cuban style to their musical bag of tricks.